Broadly speaking, neurons in the brain can be classified as either excitatory (those that drive activity in other neurons) or inhibitory (those that dampen activity locally). The balance between these two forces (excitation and inhibition) is thought to be critical for maintaining the activity of healthy brains stable, and the uncoupling of this balance has been implicated in a number of brain disorders that include schizophrenia, intellectual disability, and autism spectrum disorders. However, the mechanisms that control the emergence of this excitation-inhibition balance during childhood, as neurons in the brain wire up, is less well understood. A new study from the labs of Vassilis Pachnis at the Francis Crick Institute and Juan Burrone at the Centre for Developmental Neurobiology and the MRC Centre for Neurodevelopmental Disorders at King's College London, published in the latest issue of the journal Cell Reports, uncovered a novel mechanism that determines how the number of inhibitory interneurons is established in an area of the brain known as the cortex. 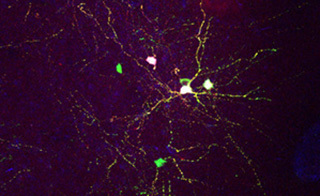 Building on previous findings showing that the final number of inhibitory interneurons in the brain is fine-tuned by a process of cell death that allows excess neurons to be removed from the network, the research team followed the fate of inhibitory interneurons during development to understand how this event was controlled. Taking multiple approaches that allowed them to modulate the activity of neurons in the brain, they found that the process of cell death was remarkably malleable and could be controlled by neuronal activity itself: higher levels of activity rescued interneurons from death. In what appears to be a feedback loop, interneurons in the brain will undergo cell death until the right levels of activity in the brain are reached. 'This is an elegant way of precisely controlling interneuron numbers in the brain' says Guilherme Neves , one of the leading authors of the study 'we propose a simple mechanism that helps maintain how a stable ratio of excitation and inhibition emerges in the developing nervous system: increased activity leads to an increase in the number of inhibitory interneurons by reducing their naturally occurring cell death'. Their findings also have potential therapeutic implications. By exploiting the emerging technologies of chemogenetics to modulate neuronal activity and cell grafting to transplant interneurons into the brain, they found that more grafted interneurons survived when activity was increased in a cell-intrinsic manner. The increased survival of transplanted interneurons could be exploited as a potential therapeutic approach for the treatment of brain disorders such as epilepsy, where the brain is hyperactive. The model proposed by Denaxa et al. is further supported by a study from the lab of Gordon Fishell, at Harvard Medical School, published in the same issue. They also found that a larger fraction of interneurons survives in the adult brain when activity is increased in other ways, such as the introduction of ion channels that increase the intrinsic activity of neurons, while ion channels that reduce activity promoted cell death. Their study further characterized the molecules responsible for sensing these changes in activity, ultimately controlling the process of cell death. "Both studies further increase the number of recent publications that support the hypothesis that interneuron maturation is a dual process, which involves developmentally imposed genetic programs, that are modified by environmental input, in terms of network activity" says Myrto Denaxa, former Crick senior investigator scientist and current group leader at BSRC, Alexander Fleming Institute. This work was supported by ERC Starter Grant 282047,Wellcome Trust Investigator Award 095589/Z/11/Z, an FP7 EC DESIRE grant, and a Lister Institute prize (to J.B.). Work in V.P. 's laboratory is supported by the BBSRC (BB/L022974/1), the UK Medical Research Council (MRC), and the Francis Crick Institute (which receives funding from the MRC, Cancer Research UK, and the Wellcome Trust).